Current Status: Hero Dogs Graduate, partnered with Veteran John-Mark P.
Puppy Scholarship: Friends in honor of Arabelle Kossiakoff’s 101st birthday! In November, Buddy and Pal had to do the hardest thing and drop me off at K-9 college, aka Hero Dogs kennel. Even though I miss them dearly, they did a great job preparing me for my dream of becoming a service dog for a veteran in need. I hope I make you proud Buddy and Pal. Being one of the youngsters in the kennel, I get picked more often to go on outings to work on numerous skills important for all service dogs in training to master. Some of the commands I'm currently working on is maintaining my attention on my handler while we are out in public. I'm still a little puppy-ish, so it may take me a couple more of times out rock this command. I am constantly working on basic commands, such as sit, stay, come, heel, and side. As a service dog, you need to have instant willingness to all commands given without any hesitation or pointing where I need to go all the time. I'm trying really hard to retrieve random objects without destroying them, such as cardboard. Obviously a service dog isn't supposed to be a shredder of paper...they have a machine for that! Since I'm a little on the tall and lengthy side (and not to mention ruggedly handsome), I've been learning how to brace a human without flattening out like a pup-cake! Apparently trying to be the first pup up the stairs without my human, is frowned upon! I guess if my veteran needs help going up and down the stairs, I need to be by their side taking it one step at a time. I've been able to perfect my some of my skills during my numerous outings. Where better to practice skills at than Home Depot. It's a huge store with loads of things to pick up off the floor, place in the cart, and finally on the counter for the cashier to scan. Plus there were thousands and thousands of new smells around the store ready to be discovered, but my focus was on my handler...well most of the time. I have also ventured out to the grocery store, the mall, and pet store. The hardest place for me was the pet store. So many yummy dog treats within a snouts grab, but I managed to "leave it" when told to. I found the birds in the store far more challenging than the delicious smells throughout the store. I swear they were mocking me with every tweet! I love being chosen to represent Hero Dogs for home visits and fundraising events. Home visits for potential volunteers and veterans is exciting because it means I get to meet new friends that might give me extra scratches behind my ears (hint hint new friends). Speaking of friends, our pals at VeRUS presented Hero Dogs with a check for $10,000 and Barbara picked me as her date to receive it! I can buy a lot of toys and treats with all that money; however, I'm positive Jennifer already has a better plan for the money. Well I better get back to counting down the days until I see Buddy and Pal again for Monday morning classes. 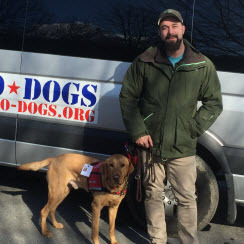 August/September Blog from Hero Dogs "Munro"
These past two months have been a lot of fun! We went to the beach, the Nationals' Stadium, IKEA, and cross country meets. I also got to play with my one-year-old friend, and I even got to visit the Fire Department! In August I went to the beach with Pal and some of her friends. It had been a while since I had been there and it felt good to be back again! When we went on the first day, the waves were huge. I have to admit it was a little bit intimidating, but Pal showed me that it was okay to get my paws wet. During the afternoon when we went down to the beach, I had to sit quietly with Buddy and watch Pal swim with her buddies. It was very windy and sand was blowing all over my face, but I was still happy to be there. When I was down at the beach the next day, my dog friend Tripper was there. I had to use self control to not play with her because I was on duty. On September 11th, Pal, Buddy, and I, as well as some Hero Dog friends, all came down to the Washington Nationals’ Stadium where we got to walk out onto the sidelines. We were there because we were being honored. Before we got out on the sidelines we got to walk through the dark baseball tunnel, which was full of United States Navy Plebs dressed in their dress whites. They were being honored as well. It was a very tight space and there was a lot of talking. It echoed wall to wall but I walked through it calmly. When I looked up, I could see the bright light; it looked just like it does in the movies! When we were walking through the tunnels, the Plebs were high fiving Pal and Buddy and saying thank you; I felt very important. It was a mutual thank you between Pal and Buddy and the Plebs. Once we were out on the sidelines there were lots of other dogs with me, which made it a little challenging to walk in perfect heel position. Once I walked past them I laid down next to Pal and Buddy’s feet while listening to our National Anthem. We stayed to watch the game which meant I had to lay underneath one of the stadium seats. It was a bit cramped. Eventually we got a little hungry so we decided to stand up and get some food. Once we were in the food line I noticed that people had left behind some goodies on the floor, but Pal told me they weren’t for me, so I stayed clear of them. I went to IKEA with Pal and Buddy to return some things. I have to say it was the biggest store I had ever been in and there were so many things to see! There were lots of people and huge carts full of things. I met a seeing eye dog trainer while we were there. Pal and Buddy enjoyed talking to her. She said I was doing a very good job which made me proud. After returning things we went to lunch. Pal and Buddy got deliciously smelly things and I got to go underneath the table. Nobody gave me any food, though. All I got was kibble. I went to several cross country meets. The first one I went to was a little confusing. I had never seen anyone run without me, but after the first one I got used to it. There were many cheering people which was very exciting. It was a little challenging to not get to run with them the first time. I got to play with my one-year-old friend several times, almost once a week! He likes to play with my jowls, and my ears - and occasionally pull them, but that is okay. It is good training! He is just learning to stand on his own, so he enjoyed leaning on me and pulling up on my fur. He likes to pet me and I like it too! I went to a Fire Department and saw a little tiny puppy. Pal told me I was once that size which was very hard to believe! Pal showed me an ambulance and I got to climb inside! There were a lot of different smells, and when I jumped out of the ambulance there was a weird texture to the steps. I also saw a big man dressed up as a dog. First I thought it was a real one and was a little scared, but then Pal reassured me it was just a person and I was okay with it. Pal and I said “hi” to a very nice adult with a disability and we all liked each other immediately. In these last two months I’ve been working on the commands "Take It," "Bring," "Paws Up," and "Drop." All in all, I’ve had a great two months and I cannot wait for another adventure with Pal and Buddy! Click here to read Munro’s full blog.